Mirrors enhance the lighting and overall sense of space in any room. They are a practical necessity helping us look our best every day. Whether framed or frameless, beveled or flat they create a virtual window full of light and color. A mirror is generally one of the last design elements installed in bathroom. 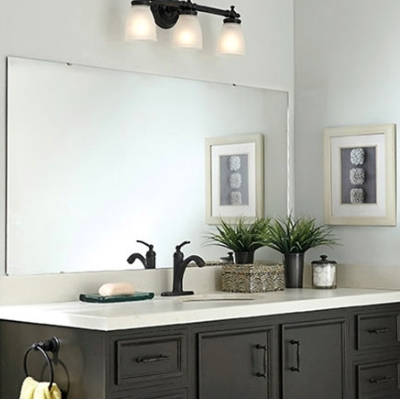 If the mirror is full sized it is usually positioned in such a way as that it is either resting on the backsplash surrounding a vanity top or on the vanity top itself. Depending on the size this can become an issue if the mirror interferes with the removal of the existing vanity top. The stresses created by prying and pulling up the old top can chip the edge of the mirror or worse cause it to crack and break. In such cases the mirror has to be removed prior to the installation of the new countertop. Countertop fabricators/installers won’t tackle the removal of a large wall mirror because of the risk of breakage. Be sure to bring this up when you discuss your project with your fabricator to come up with a plan of action. In 1993 Solid Surface Designs, Inc,. began business as a factory certified fabricator-installer for DuPont Corian. Since then we have grown to become the region's largest fabricator and installer of Granite, Quartz and Solid Surface countertops.